For this month’s pillow, I have taken my inspiration from Diane Gaudynski’s Guide to Machine Quilting. I have owned this excellent, comprehensive book for many a year. Diane is a very talented award winning quilter and I admire her work very much! You can find lots of eye candy and free motion quilting tips on Diane’s blog! The ‘J’ is the initial of the name of a good friend to whom I will be giving this pillow. A layer of batting is stitched with water soluble thread, and then carefully trimmed. I wish I were better at taking photos, especially of white on white! Since my friend likes pink, I am using a 40 weight pink variegated Aurifil thread for the feathers and the letter. The rest of the wholecloth quilting is done with 50 weight white Aurifil thread. You can begin to see the texture forming! Like the other pillows that I have been making, this one is simple with a covered zipper. I participated in QuiltShopGal’s 2012 Free Motion Quilting Challenge, so it would’ve been fun for me to repeat Diane’s lesson and compare the ‘then and now’. I may do that yet. 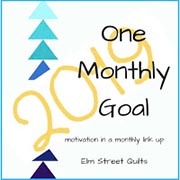 However, I am doing Option 2 from this year’s Free Motion Quilting Challenge, and I will be linking up over there. For my first initial pillow, I chose to create a pillow cover for my youngest grandchild. This time, I have created a pillow covering for my oldest grandchild. His favorite color is orange, and he is partially color blind. I wanted borders around the letter and star so that I could use a variety of free motion quilting designs. Whether I am free motion quilting a pillow cover, or a full-size quilt, I like to begin by stitching in the ditch to stabilize my project. It also allows me to remove the pins so that they no longer hinder my stitching (I quilt with a domestic sewing machine). Wonderfil Invisfil is my favorite thread to use for stitching in the ditch. I used one of Cindy Needham’s stencils to easily mark quilting lines on the star points. I could have used several choices of markers, but I used chalk that I pounced on. I also like to use Pam Clarke’s stencils for marking. The grids are great for spacing even distances for parallel quilting or many other types of designs. The rest of the free motion quilting on the pillow cover was done without marking. I use Aurifil 50 weight thread for the quilting. The pillow back has a concealed zipper. There is a lot of texture after washing! I am doing Option #1 from QuiltShopGal’s Free Motion Quilting Challenge 2015 March (featuring Patsy Thompson). Here is a link to the post that shows my participation in the Patsy Thompson part of the Free Motion Quilting Challenge 2012. Thank you so much to SewCalGal and her talented and generous free motion quilting teachers! I have enjoyed a year’s worth of practice and growth since joining the Free Motion Quilt Challenge. Each month, in 2012, a new challenge was presented. Frances Moore gave us a fun leaf design to practice free motion quilting. She also gave us a video to view. You can see this post here. One of my favorite experts, Diane Gaudynski, taught feathers this month. What a treat! You can see this post here. Ann Fahl, suggested keeping a binder/journal of free motion quilting ideas. She also suggested learning meandering patterns other than stippling. You can see this post here. Don Linn created a video tutorial for April. He showed a great transfer method for quilt designs! He also described an easy way to come up with quilting designs. You can see this post here. This month’s free motion quilt expert was the generous Leah Day. Leah gave two assignments…a Double Stipple and Railroad Tracks. You can see this post here. The June Free Motion Quilting Challenge was a tutorial by Cindy Needham. Cindy gave us so much useful information and lots of practice! I loved this month! Cindy suggested the ‘divide and conquer’ method. You can see this post here. Angela Walters, Quilting Is My Therapy, taught how to section off the work and then fill in the sections. She calls this quilting design Tiles. You can see this post here. The August Free Motion Quilt Challenge was a tutorial from Wendy Sheppard. You can find her blog at Ivory Spring. Wendy shared her “Jester” free motion quilting design for this challenge. You can see this post here. The September Free Motion Quilt Challenge was a tutorial Paula Reid. Paula’s tutorial had us practice with a stencil. You can see this post here. Teri Lucas had us begin this month’s tutorial by drawing our names and designs on paper. We branched out from there. You can see this post here. Sarah Vedeler had us practicing spiral variations; lots of fun! You can see that post here. Patsy Thompson shared border design and quilting tips. She created a terrific video to demonstrate her tips. I loved this month! You can see that post here. Linda Moran, Susan Brubaker Knapp, Diane Loomis and Teri Lucas all provided bonus challenges. I look forward to doing those after the holidays. What a wonderful year of quilting! The December Free Motion Quilt Challenge at SewCalGal is a tutorial from the wonderful designer and teacher, Patsy Thompson. Patsy is one of my favorite quilt artists, so I was delighted when I found out that she was the guest for this month! Patsy shared excellent tips for border designing and quilting. So I got out my high tech practice notebook and went to work. I sewed some hand-dyed fabric together, pin basted a quilt sandwich, and, using 100 weight Wonderfil Invisfil, stabilized my sandwich. And this is where this month’s challenge became a double challenge. My beloved Bernina (we’ve been together about 25 years) just couldn’t manage a simple straight stitch. I knew she had troubles…she’d been to the doctor once already (he turned out to be a quack…but that’s another story). I’d been wanting another sewing machine, but had been putting it off. So, with lowered feed dogs, and 50 weight Aurifil, we did alot of free motion quilting…Patsy style (or at least our best imitation for where we are in life). I wouldn’t make such large pebbles on this size quilt in the future…don’t like the look of that, but I thoroughly enjoyed making feathers with a flexi-curve ruler. I’ve had that ruler for years, yet never realized it’s potential. Thank you Patsy! I have yet to sew with Miss Janome and have the feed dogs up. I’ll be doing that when I put on the binding.